The Doge’s Triumphs, shown by the Doge in every solemn and public occasion, have a definite historical and symbolic significance that dates back to 1177 AD. Here is a summary of their description and their meaning. 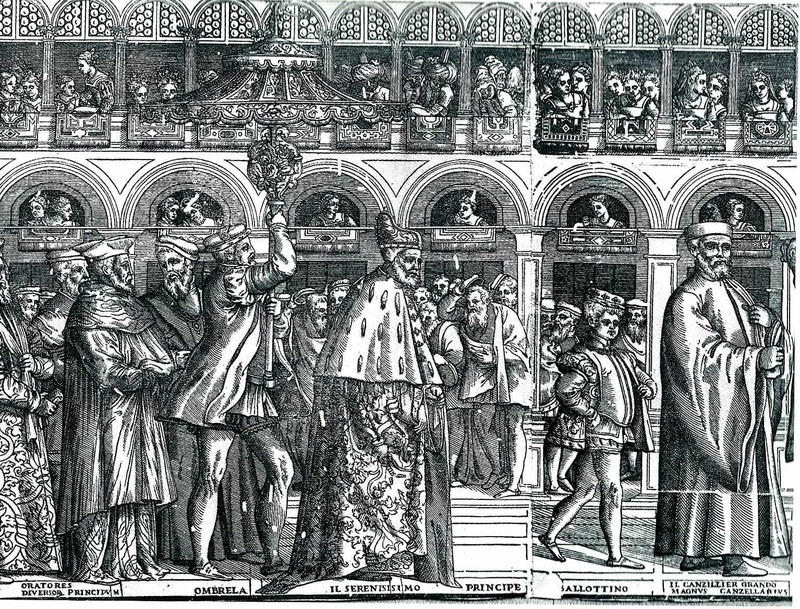 In occasion of the Peace between the Emperor Frederick Barbarossa and Pope Alexander III, which took place in Venice in 1177 AD in St. Mark’s Cathedral, the Doge Sebastiano Ziani obtained by the Pope Seven Symbols of Power called “Triumphs” as a gift and gratitude for his skillful mediation. The first triumph was a white candle (symbol of honor and fidelity to the Church and to the Pope). The second one was the seal of lead (to authenticate and sign official documents with the same papal sovereignty). The third triumph was the “stocco” a golden sword (the Doge was recognized as the defender of Christianity and the Chief of Justice). The fourth one was the golden ring, used by the Doge on Ascension Day to celebrate the rite of the “Marriage of the Sea” (symbol of perpetual dominion). The fifth one was the umbrella (which covered the Doge during the processions, symbol of Imperial and Pontifical respect and dignity). The sixth triumph were the triumphal flags: eight colored flags, as a sign of power and glory of Venice: two White flags (Peace), two red flags (War), two Blue flags (Alliance), two Purple flags (Truce). The six silver trumpets are the seventh and final triumph. The Heralds played them, as a symbol of the Doge’s prestige, honor and glory. During his luxurious ceremonies, the Doge used a “Faldistorio” (a throne) and a golden cushion below his feet. He also had the two crowns of Cyprus and Heraklion (sign of power over the two islands).